Ism e Azam is in fact hidden in the names of Allah. Ism e Azam can change your lives. Every Muslim is in search of Ism e Azam but people face difficulties to find Ism e Azam. In this post I share Isme Azam Calculator, this calculator developed a formula for finding the Ism e Azam of your name. This calculator is very effective and many people find their ism e azam by using this calculator. You can easily find the Ism e Azam of your name using this program. Know the name of Almighty Allah which resonate with your name and recite it daily in your prayers. Inshallah by the power of Ism e Azam Allah Almighty will give you whatever you want. According to the knowledge of Quran Isme-Azam contains the Great name of Allah. Many people know the benefits of Ism e Azam but they struggle to get his/her Ism e Azam and even if success to find one they get it wrong. If you do not know how to know your own ism e Azam then this article is very helpful for you. In this article you can learn very simple method to find to your personal Ism e Azam. The good feature of Ism e Azam Calculation is not only to find exact digits. It will also provide a complete list of matching Ism e Azam according to your name. To use Ism e Azam Calculator you need to install Ism e Azam Calculator Software first. The downloading link is given in above. After downloading and installation of Ism e Azam Calculator in to your personal computer, open it. You will see a window like this. Enter your name in Urdu Language. Click on tick sign given in right Top (Green Tick Sign). Now Calculator will takes a few seconds to calculate which are matching name of Allah according to your name. After few second the calculator gives a complete list of Asma Ul Husna which are matching to your name. We should recite all names of Allah in our prayers daily by doing this you will complete the cycle in 99 days. But try to know the meaning of Allah names of Allah and recite them with belief. Allah 99 names can change our life. Recitation of each name of Allah can bring positive changes in our life. These name can solve all our problems. Recite Ism e Azam 11 times before Darood Sharif 7 times and then pray for dua. Inshallah your wishes will becomes true. We also recommend the following for success of your dua. Recite One name of Allah after every Namaz. 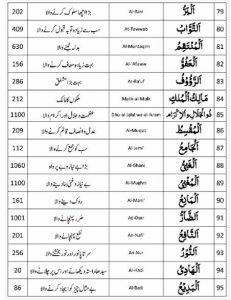 Recite names of Allah as many times as possible. If it is not possible to recite most of the time, then atleast complete the number you come up with your Ism-e-Azam. Agar aap ka pora naam Hasfa Malik ha tu aap k naam k hisab se aap ka Ism azam Al Basit aur Al Nafeo ha. Aaap in ism azm ko kis b namaz k bad apney naam k adad k mutabiq parayin. Aap k naam k mutabiq aap k ilum adad k mutabiq naam k adad hain 273. Is lehe aap kisi b namaz k bad 273 bar Ya Basit aur 273 bar Ya Nafeo par kar jo b dua Allah se mange ge wo Insha Allah foren qabol ho ge.